A new housing development, with its energy supplied through LPG gas, is able to benefit from one source of energy, as LPG can supply a home’s central heating, gas fires and cooker. Housing developments are able to benefit from having underground tanks installed to protect the look of the area if the developers wish. 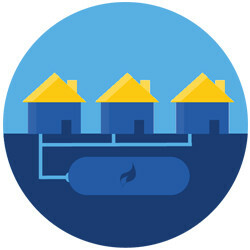 Business parks and industrial developments can reap the same benefits as homes by being connected to a metered LPG supply. Setting up a bulk LPG supply is a simple process, we will visit your site and advise on the best supply options to make sure it fulfils your needs and protects against any future development.